I always associate the first regular catches of Gurnard with the start of the summer fishing season. The Gurnard are normally closely followed by another of my favourite eating species the Black Bream. This week has seen a number of nice Gurnard landed and it comes as no surprise that my friend, Roger Morgan had one the other evening. He always beats me too it every year. 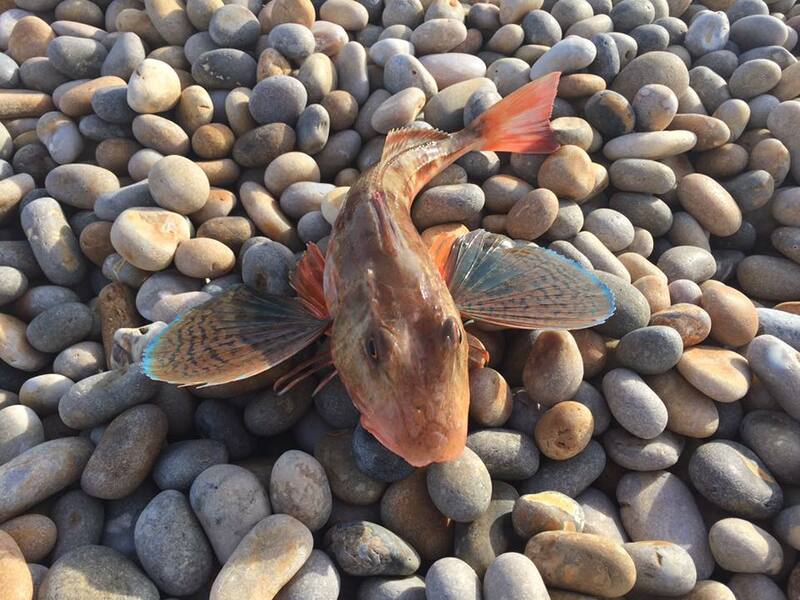 I think you will agree with me that this is a lovely looking Gurnard. Adam Goldie contacted me earlier in the week, asking for some advice on a mark for Bream. 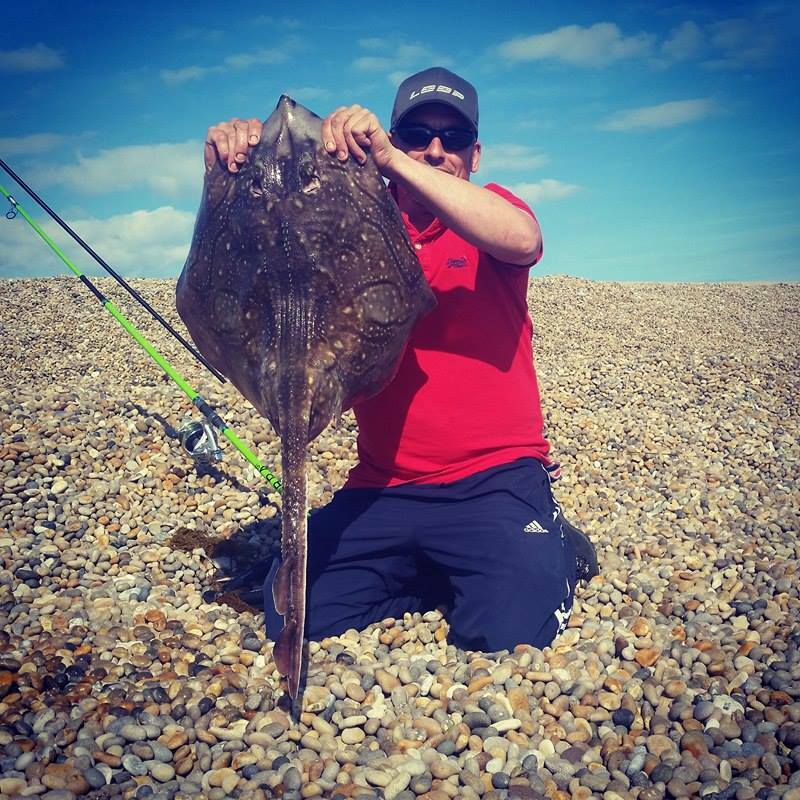 He may have been a bit disappointed on not catching any Bream, but he was delighted with a 10lb 12oz Undulate Ray instead. Thanks for the response to the poll that we set. It looks like 8pm is the most popular time to broadcast it. Today’s report and forecast is a bit short on February details today as we are currently on Chesil in search of some Smoothound and Rays. We will be running a live Facebook broadcast from there at around midday today. It will stream on Live Sea fishing UK Facebook page and my own page. Portland: Swell with clearl water. Chesil Beach forecast: the weather looks a bit rough over the weekend, but today looks good for Mackerel, Bream and Smoothound . Portland: Water clarity is good for Pollock and Wrasse. Portland Harbour: The big tides should be good for Bass in the harbour, as well as Pollock and Wrasse. Once again the Bass are in close, so keep your casts to 30 yds and you are more likely to pick up a fish, rather than at 100yds. I am hoping that we will see some Gilthead Bream showing soon. Weymouth Bay: The inner harbour is much clearer now. I spotted a good number of Mullet cruising around. Use a small Mepps spinner with a bit of Ragworm attached to a single hook, to tempt the fish. Have a quick look at this Thin Lipped Mullet article for more details. Preston should produce some Gurnard, Dab and Flounder during the day, with the chance of Rays and Smoothound at night.